We’ve been making some great progress on the Lumbering Contraption. 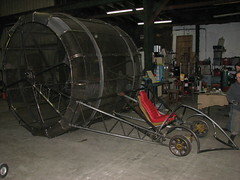 We’ve only got a few more days to finish before bringing her out to Santa Rosa for the Handcar Regatta. \as well as some wonderfull photos and a bit of video by Nick Winterhalter on his Flickr page. Next PostNext LUMBERING CONTRAPTION FINISHED!